Derick Brassard swiftly became comfortable in his new surroundings with the Pittsburgh Penguins. Brassard, acquired by the Penguins in a three-way deal with the Ottawa Senators and Vegas Golden Knights Feb. 23, was very aware of what the back-to-back Stanley Cup champions were all about. The Penguins, who blanked the Philadelphia Flyers 7-0 in their first-round opener Wednesday, have eliminated the team Brassard was playing for in the better part of the past two postseasons. In 2016, Pittsburgh took care of Brassard and the New York Rangers in five games in the first round. Last spring, he was left with a bitter feeling after Chris Kunitz scored in double overtime to give the Penguins a seven-game series win against the Senators. "I couldn't really believe it because a couple of years ago I was playing here,” said Brassard, when asked about the trade. “I faced [the Penguins] a couple of times, faced those guys with Ottawa. I would've never thought a couple of years ago I'd be playing here. "I'm pretty familiar with the team." This is the third time Brassard has been traded in the last five seasons. First, he went from the Columbus Blue Jackets to the Rangers, then from the Rangers to the Senators and from Ottawa to Pittsburgh. There is a reason the 30-year-old from Gatineau, Que. has been on the move so often. He’s proven to be a reliable playoff performer, dating back to his final two seasons of junior with the Drummondville Voltigeurs when he checked in with 14 goals and 33 points in 19 postseason games. The bigger the game, the better Brassard played. He saves his best hockey for the playoffs. He continued to exhibit as much in his first year of pro with the AHL Syracuse Crunch with four goals and 13 points in 13 playoff games. But when he was promoted to the Blue Jackets full time in 2008-09, Brassard didn’t participate in a postseason until he was dealt to the Rangers at the 2013 trade deadline and became known as Big Game Brass. This is Brassard’s sixth consecutive playoffs, scoring 22 times and registering 56 points in 79 Stanley Cup postseason games after chipping in an assist on Wednesday. “The playoffs, you have to get to another level," Brassard said. “I feel it's just a matter of putting the passion of the game, the emotion. I felt, especially in New York, it really pushed me personally to try to be the best player I can be. One of the reasons the Penguins have been a really good team was their strength down the middle with captain Sidney Crosby and Evgeni Malkin leading the way. But Pittsburgh lost two key centres, Nick Bonino and Matt Cullen, to free agency last summer. Brassard has filled a void at centre. Brassard, who underwent shoulder surgery last summer, missed the final five games of the regular season with a groin injury. But he was back with regular linemates Conor Sheary and Phil Kessel in the series opener against Philadelphia. Kessel was drafted by the Bruins fifth overall in 2006, one spot before the Blue Jackets selected Brassard sixth. 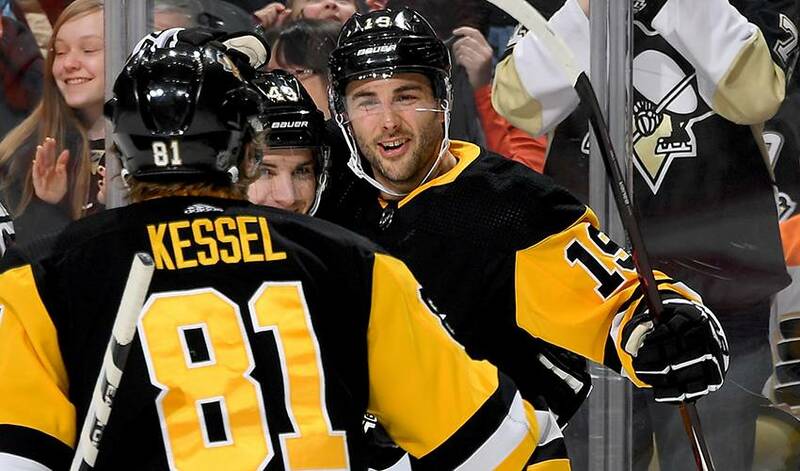 Brassard has grown to like Kessel on and off the ice. "Yeah, he's quite something," Brassard said. "He's really funny. He's probably the funniest guy in the room. He's a good personality to have on the team."